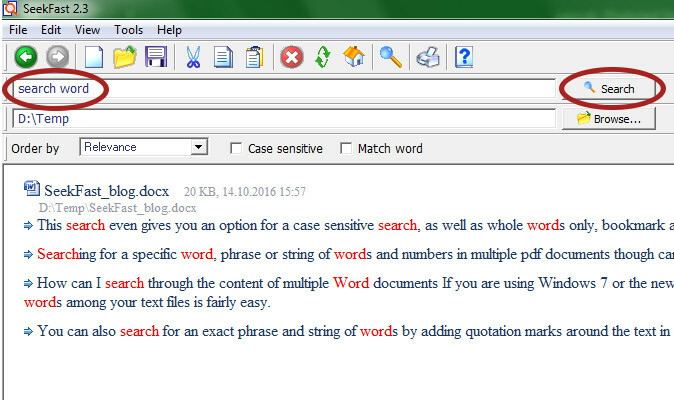 How to find text inside multiple documents (Word, Excel, PDF, OpenOffice, text files)? If you tend to work with a lot of documents at home or at work, you have probably noticed how slow and irritating finding the exact document you are searching for within all your files and directories is. Often the best way to do that is to search for a particular word or text from that particular Word, Excel, PDF, OpenOffice to other text file document. This can be a very slow and tedious process if you choose to use the built-in search option in Windows Explorer. Often the results of the search are not properly filtered and organized, so you need to spend ages scrolling up and down and opening one document after the other. Thankfully, there is specialized software which makes this whole task easier, faster and hassle-free. With SeekFast you can do a quick and in-depth search among all of the documents in your home or office computer in a matter of seconds. This intelligent word search desktop application is very easy to use, thanks to its intuitive design. You can easily and very rapidly search through the content of all of your files performing a quick and precise search for a specific word, phrase, number, a string of numbers, symbols or other. The most relevant search results will appear at the top, just like in Google and Bing. You can get a preview of each file with one quick click and without the need to open each and every one of them. This handy text searching tool doesn’t index each and every file on your computer like the Windows Explorer integrated search option. This and its ease of use and high precision are among the main reasons why tens of thousands of users worldwide are using this tool on a regular basis. You can access your desktop SeekFast tool with one click and after a few seconds you will get the results and gain quick access to the exact file you are looking for no matter whether it is doc, docx, ODT, xls, xlsx, pdf, rtf, txt, XML, Java, HTM, HTML, PHP or any kind of file including words or numbers. The developers of this useful software have improved it through the years, and now you can search for several different words at the same time. SeekFast analyses them and provides the best results in accordance with the proximity of the text, the frequency of occurrence in the document and other factors. As a result, you are very likely to end up with the exact document you are looking for on top of the search result list. More so, the tool can search for documents written in nearly all languages, so no need to worry about finding a particular file written in a language different than English. This will save you a lot of time and trouble of having to go through endless documents until you get to the one you are looking for. SeekFast is a very fast and accurate personal search engine for your computer. You can try out this efficient and useful search tool for free right away, and you will soon agree that searching for a particular file in a computer stuffed with documents has never been easier. Download SeekFast now and see for yourself!